Our human divinity is bone-deep, lit by the red light of our souls’ truth and sourced straight from the cosmic womb. I have an insatiable hunger for Her fierce mother-love, as I believe all members of our global collective do, and I am calling out and calling on all wild Priestesses of our world to join me in Her resurrection. I am howling from the dark depths of every forest, and I am crooning a siren’s song from every body of water I can find. I am seeking you out, the wild woman who is through making apologies for her own divinity, the Witch who is handcrafting her own religion stitched from her own truth, and the blessed incarnation of every human being who can still feel Her. I will speak to you directly, for you are a Wolf-Woman of my bloodline and we share the same language, the heathen Mother Tongue of the wild word. I hereby vow to validate your experience, your spiritual autonomy, and your magickal agency as we walk this misty and uncertain path together, and I will not ask you to sacrifice anything you know to be sacred. I do not assume that your life matches mine, and it is the uniqueness of our lived experiences of Her that will truly nourish the divine feminine in us all, rather than the bland and bleached homogenization of the Goddess experience. As women of the wild, we deserve our own holy books, our own teaching tales, and our own venerable verses of validation. The spiritual wisdom of the feminine has always been born of lived experience, and the hooded Crone in all of us knows that her truth, her cyclical ways, are unique to her and her alone. The her-stories I offer here have merit only in their meeting with your own life; they do not stand alone as immutable truths or a step-by-step path toward any lofty and permanent healing goal, nor do they assert any secret mysteries that I alone am privileged to know. Without their soul-specific relationship with your memories, passions, woundings, and core values, Priestess, these verses are only words. Without your willful exploration of how the feminine archetypes I discuss in this heathens’ bible live and breathe within your own psyche, their names remain merely the default teaching tools used by outmoded traditions that have long required feminine shame to survive. The women who have been locked inside the books they called good deserve liberation from their externally imposed immorality. We must unlock the cages in which they have been contained for so long, trapped behind the iron bars of judgment and dismissal. We women of this evolving world are tasked with their redemption, for they are we. We share the scars of every woman who has been condemned to ever be spiritually imprisoned, and, in these pages, I offer all the primal feminine technology this Witch has in her toolbox to dismantle the indoctrinated beliefs that continue to limit our spiritual autonomy; divorce our bodies from our spirits; and fence in what is, by nature, untamed, heathen, and wild. The roots of the word heathen run far deeper than its derogatory, godless connotation; it is believed to come from the Germanic word meaning “dweller on the heath, one inhabiting uncultivated land.” To be heathen means to belong to the wild, to take our lessons from the natural world, and to be nourished by what we fundamentally are rather than what we are told we must be. Let me distinguish here between Heathenry, a polytheistic neo-Pagan religion for which I have much reverence but to which I do not belong, and the eclectic pre-Christian landscape of our ancestors. To be heathen is to remember the rawestessence of our worth, what is most authentically human about this flesh-and-blood body we find ourselves in, and what is left when our most carefully constructed psychic temples, those long-held belief systems that once served us so well, crumble into dust. Every one of our bloodlines is rooted in an Earth-based tradition if we only follow our lineage back far enough, and every one of our souls longs to come home to the wilds. 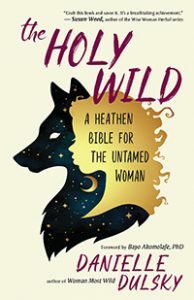 Danielle Dulsky is the author of “The Holy Wild” and “Woman Most Wild”. She is an artist, yoga teacher, energy worker, and founder of Living Mandala Yoga teacher training programs. 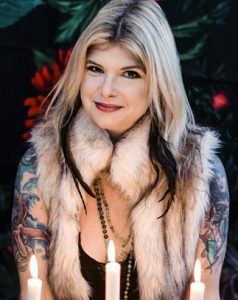 She leads women’s circles, witchcraft workshops, and energy healing trainings and lives in Phoenixville, Pennsylvania. Find out more about her online at www.DanielleDulsky.com.